A Mont Blanc 149 piston-fill fountain pen with gold plated trim and in superb condition; the pen has been used but not a lot, I would think, and dates from the late 1990s; it writes nicely; its in super condition with a fine grade 14ct gold two-colour nib; beautiful! This pen is boxed and the box is good. This pen has recently come back from Mont Blanc having had a complete new cap and body fitted and overhauled; it has not been used since. A very-nice used but undamaged Mont Blanc Classic (I think) fountain pen in black with gold-plated trim and a Mont Blanc No.28 clip-operated ballpen; this pen is a cartridge or converter-filler and has a converter fitted; it has a medium grade 14ct (585) gold nib that is a delight to write with. 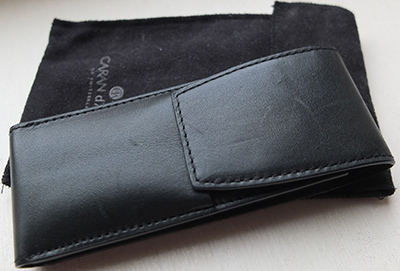 They are held in a MB leather case. A very nice lightly-used 14ct gold propelling pencil; the pencil is marked on the clip 585 which would indicate it to be of Continental manufacture; this is a really nice pencil and will last a lifetime; there are no dings on the body of the pencil but the top-hat end has a bruise; there are spare leads in the magazine. A Mont Blanc 149 piston-fill fountain pen with gold plated trim and in superb condition; the pen has been used but not a lot, I would think, and dates from the late 1990s; it writes nicely; its in super condition with an extra-fine grade 14ct gold two-colour nib; beautiful! This pen is boxed and the box is good. This pen has recently come back from Mont Blanc having had a complete new cap and body fitted and overhauled; it has not been used since. A Mont Blanc Etoile ballpen in its original box with booklet; the pen has been used but is in lovely condition with a diamond in the top of the cap. 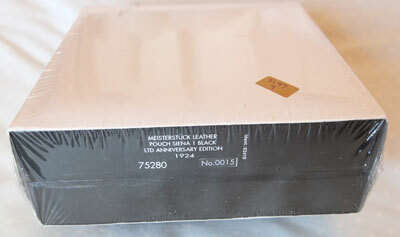 A mint unused NOS Mont Blanc Size 1 Pouch in black leather and in its original box with paper lining. A used but undamaged Mont Blanc No.24 fountain pen in black with gold-plated trim; this pen is a piston-filler and has a medium grade 14ct gold nib that is a delight to write with. A Visconti Voyager ballpen in Honey Almond finish its original beautiful leather box with booklet and outer sleeve; I don't think it has ever been used. A Mont Blanc 146 Nib Selection Set comprising 8 MB146 fountain pens and a MB145 fountain pen; the 8 pens are piston-fill fountain pens with gold plated trim and in superb condition; the 145 is a cartridge or converter-fill pen with a converter fitted; these pens have all been inked and used in a shop to allow customers to select the most suitable nib for themselves; each pen has a different nib as indicated along the bottom of the box; all are 14ct gold two-colour nib; beautiful! 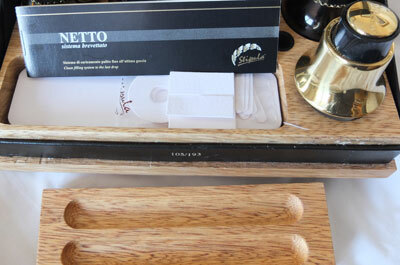 This set is boxed and the box is good with just a few marks. A used but undamaged Mont Blanc No.32 fountain pen in black with gold-plated trim; this pen is a piston-filler and has a fine grade 14ct gold nib that is a delight to write with. A used but undamaged Mont Blanc No.24 (I think) fountain pen in black with gold-plated trim; this pen is a piston-filler and has a fine grade 14ct gold nib that is a delight to write with. A used but undamaged Mont Blanc No.32 fountain pen in burgundy with gold-plated trim; this pen is a piston-filler and has a medium grade 14ct gold nib that is a delight to write with. A Mont Blanc 146 piston-fill fountain pen with gold plated trim and in superb condition; the pen has been used but not a lot, I would think, and dates from the late 1990s; it writes nicely; its in super condition with a medium grade 14ct gold two-colour nib; beautiful! This pen is boxed and the box is good. A very nice Caran D'Ache Madison Mk.1 fountain pen in its original box with its booklet; it has been lightly used but is in lovely condition; the pen has an extra-fine grade 18ct gold nib and writes nicely. A Mont Blanc 146 piston-fill fountain pen with gold plated trim and in superb condition; the pen has been used but not a lot, I would think, and dates from the late 1980s or maybe the early 1990s; it writes nicely; its in super condition with a broad grade 14ct gold single-colour nib; beautiful! A Pelikan M100 (I think) fountain pen in black; the pen dates, if I'm correct, from 1992 or thereabouts and has been used but not a lot; it is a piston-filler; the pen writes nicely and is in immaculate condition with a fine grade gold plated nib. A Mont Blanc Mozart Solitaire Doue Limited Edition ballpen in its original box with CD and booklet; mint and unused with 925 Silver cap. A Mont Blanc Special Edition Ingrid Bergman rollerball pen in its original box with booklet and outer box; mint and unused. A Mont Blanc Special Edition Greta Garbo fountain pen in its original box with booklet, outer box, and outer sleeve; mint and unused. A Mont Blanc Etoile rollerball pen in immaculate condition and in its original box with certificate and outer box. A Pelikan M300 fountain pen in green and black; the pen dates from 2005 and has been used but not a lot; it is a piston-filler; the pen writes nicely and is in immaculate condition with a medium grade 14ct gold nib. A mint unused NOS Mont Blanc fountain pen, ballpen, rollerball and pencil in black with gold-plated trim and in a 4-pen zip pouch with outer box and booklet; the pens/pencil are of the 75 Years of Passion and Soul series and limited to 1924 units; the pens all have small diamonds in the rings of the clips. A mint unused NOS Mont Blanc Pencil 165 in black with gold-plated trim and in its original box with outer sleeve and opened cellophane 'skin'; this pencil is one of the 75 Years of Passion and Soul series and limited to 1924 units; the pencil uses 0.7mm leads and has a small diamond in the ring of the clip. A mint unused NOS Mont Blanc ballpoint pen in black with gold-plated trim and in its original box with booklet, outer box, and sleeve; this pen is one of the 100 Years Anniversary Edition series. A mint unused NOS Mont Blanc Pouch Siena 1 in black leather and in its original box with outer sleeve and unopened cellophane 'skin'; this pouch is one of the 75 Years of Passion and Soul series and limited to 1924 units; I believe the pouch has 'Mont Blanc, 75 Years of Passion and Soul, 0015/1924' impressed on the back; the picture of the pouch is not the one from this box, as its still sealed, but is very similar to the one in this box. 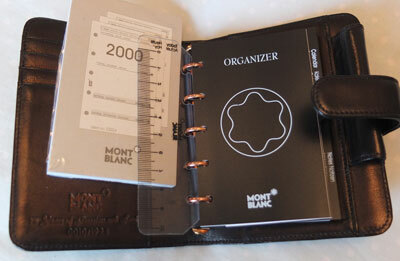 A mint unused NOS Mont Blanc Organizer in black leather and in its original box with Service Guide and outer sleeve; this organizer is one of the 75 Years of Passion and Soul series and limited to 1924 units; it contains a 1999 calendar and has a 2000 one as a spare; the one for 2017 will be available very soon from MB. 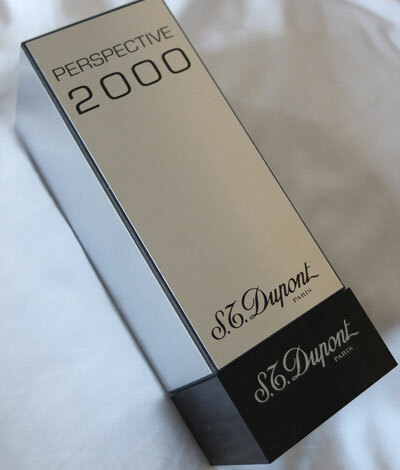 A mint unused and unopened Stipula Novecento twist-action ballpoint pen in red and black with 925 silver trim; this pen is still in its original sealed plastic sleeve in its box with outer box. 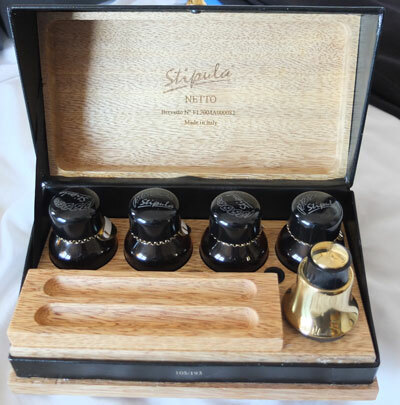 Here we have the Stipula Netto De-Luxe pen filling set which ensures your Stipula pen remains in tip-top condition with no dulling of the surfaces; this set is limited to 193 pieces and this is number 105; this is essential for the serious Stipula pen collector.